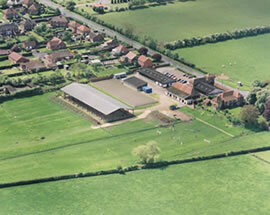 Grove House Stables Equestrian Centre is a family owned and run equestrian business established in Misterton since 1991. Since then the owners, Andrew and Libby Stennett, their children Jack and Harriet, and their team of dedicated staff have seen the centre grow into a reputable BHS and ABRS approved Riding School and Training Centre. Customers from the age of four to seventy benefit from a team of caring, professionally trained and experienced instructors teaching within purpose built facilities. These facilities include a superb new 60m x 20m Indoor Riding Arena with a computerised sprinkler system and state of the art competition standard lighting, as well as a 20m x 60m ‘Charles Britton’ All-Weather Arena with competition standard floodlights. A full set of show jumps is available for use including fillers and water trays. The Centre also provides heated lecture and changing room facilities along with outdoor jumping paddocks/cross country fences. The Dovecote Café is located adjacent to the car park and serves a wide range of home produced meals and snacks to warm you in the winter. Fourteen year old Jack Stennett has benefited from the family’s exciting training opportunities, by gaining an excellent series of results in BSJA (British Show Jumping Association) competitions on his home produced pony ‘Fancy Nancy’. During the 2007 season, he has been placed at the Trailblazers National Show Jumping Championships at Stoneleigh and has already qualified for the 2008 Blue Chip Championships at Hartpury in Gloucestershire. The Centre works with local schools, colleges and training organisations to provide a wide portfolio of equestrian qualifications. These include government funded BHS NVQ courses, Levels 1 -3, BHS Stages 1, 2 and 3 and teaching qualifications. The Centre’s team of experienced, caring instructors and wide variety of horses allows it to offer quality training to both the career rider and the recreational rider. Indeed, the Centre boasts ‘comprehensive equestrian training from hourly lessons through to examination courses’. Its motto is “your enjoyment is our priority” & this motto is a priority to everyone involved with Grove House Stables. The Grove House Stables offer private (one to one) and small group lessons for individuals to learn or update their general riding, jumping or dressage experience. Therapeutic riding for those with special learning needs is also available. Proprietor Andrew Stennett said ‘Being dyslexic and dyspraxic myself, I appreciate the tremendous benefits riding can offer to develop confidence, balance and body awareness”. The centre regularly benefits individuals with Downs syndrome, Dyslexia, Dyspraxia and Autism. In addition to the regular lessons, a range of tuition in jumping and dressage are offered for both adults and children. A programme of special festive activities is available now ready for the Christmas holiday period, including festively decorating ponies and show jumping competitions. Special small group sessions are run on Saturdays and Sundays for mini riders (age four to six) to gain co-ordination, balance & confidence in the saddle, whilst having fun. Whether you are new to the saddle or an experienced rider, Grove House Stables offers a friendly and professional service in a purpose built training environment with over 16 years of experience. The Centre is open 6 days a week, weekdays until 8pm and from 9-5pm at weekends. Have fun, relax, get fit and develop your equine skills in caring and supportive surroundings. We now have approximately 35 horses/ponies, Olympic sized Indoor & Outdoor Floodlit All Weather Riding Arenas, Show Jumping Paddock, Cross Country Jumps & Heated Lecture Rooms. You can purchase lessons and equipment online via our Online Store or visit us in person.